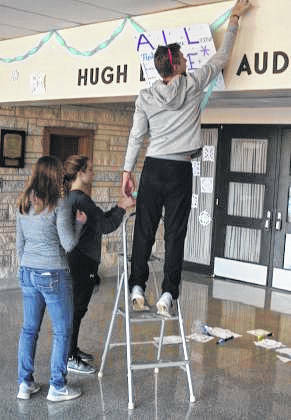 Gabrielle Scott, from left, Rachel Russ and Gabe Williams help decorate the entrance at Shawnee High School with positive messages. LIMA — Students in the Allen Lima Youth Leadership class are hoping to encourage their fellow students as we enter the holidays. When the students at Shawnee High School return to school on Monday they’ll find, at the main entrance, a blizzard of paper snowflakes that have positive messages on them. “This is one of the saddest times of the year. People start to feel lonely, depressed and we really just want to spread our message of positivity and make people feel like they have a place and that there is someone there for them and that they are loved,” said Derek Schweizer, a Shawnee High School student who is also a member of the leadership class. The leadership class decided they wanted to do something about the suicide problem among their peers. “We got together at one of our meetings and we decided, alright, one of the biggest problems we have in our community is suicide and we want to crack down on that and show awareness and spread prevention ideas and so we decided that hitting the schools, the youth, would be the best way and we’re not just going to stick to Shawnee High School, we will try to move to different schools and we are going to try to spread it as far and as wide as we can,” Schweizer said. Schweizer says he’s seen how suicide has affected his classmates. “We have had recent suicides at our school. We’ve seen the impact that can have on a school and have on other members of the school. We really just want to let those people know that they do have a place and that there’s always another way and that suicide can not be an option,” Schweizer said. Some of the messages on the snowflakes include “You are loved,” “Be happy,” “There’s always a way,” “Smile.”. The snowflakes will coincide with a separate project by the leadership class. “There’s another group in their same class that’s working on helping bring something as far as a school assembly. We also have three other projects that are working on the pressure of student testing, also peer pressure and destructive decisions,” said Adah Ellerbrock, coordinator for Allen Lima Leadership.